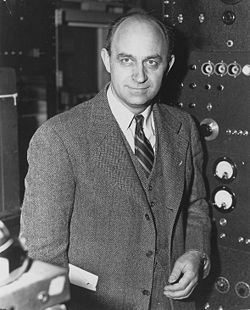 My randomly generated Wikipedia page today is Enrico Fermi, one of the men credited as the father of the atomic bomb. This guy has a very long Wikipedia article, so he must have been important. He was an Italian physicist and won a Nobel Prize in 1938. Thinking about Fermi and his work on atomic bombs made me think about warfare and the evolution of warfare. My history class in high school was a two-year course and covered history in North and South America from European settlement to Bill Clinton’s presidency. So, I guess you could call it comprehensive. And when you start learning about power and warfare with arrows and end with the concept of Mutually Assured Destruction, it allows for some ruminating on weapons and war and human nature. So that’s what I did a lot of. In between our readings on Canadian settlement, and John Brown and Batista, I would think about how the bow and arrow had been used first to hunt animals and then to fight battles. I would consider how throwing fire had changed to firepower and guns replaced spices as a valuable trading item. I would picture bayonets with their blades to puncture at close distances and then think of long range sniper rifles. And then I’d think of logical advance from bullet to bomb. Technology is so much more fascinating than human evolution because it doesn’t have to wait for a lucky mutation. It can plan, it can build a better model based on the existing one. We don’t get to redesign our spines with every generation, but a generation of weapon design can increase a death toll by thousands. When we read about Hiroshima I remember feeling frustrated. Not at the irresponsibility of Truman’s trigger or stripping away forever of simple strategy and rules of warfare in one cloud of radioactive dust, but at the surprise of the world. Why didn’t they see it coming? Why didn’t we guess that an knife couldn’t stay a knife a knife forever or that a grenade would lead to something too dangerous to hold in your hand? One of the last things we covered in the class was the Gulf War. We watched a video of the news reporting on Iraq to learn about the media was initially denied much information about the war. The tape showed planes flying over a town and then dropping bomb and after bomb erupting the small village into what looked like a field of matches burning to stubs. My teacher said that he remembered seeing this sort of footage live on TV as a teenager. He said he remembered thinking it was cool, that it looked like a video game and he could imagine playing it. Drone attacks didn’t surprise me either.